Conducting a Map search within Find. 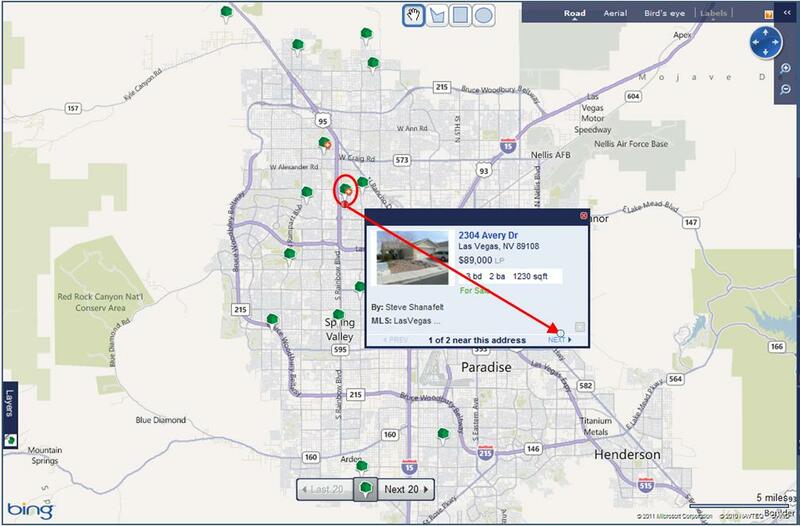 Another useful way to search for properties is by using Find‟s Map Search capabilities. You can zoom into a desired area, display layers for additional information, and create a My Neighborhood area to outline a specific region. By default the map is hidden until you display it by clicking View on Map on the Property Search page, or by expanding the Map sidebar. When you run a search, the map displays the properties showing on the active Search Results Page. Properties matching your selected criteria display as color-coded pins. Green : for sale/active/pending/new construction. Red : recently sold properties. Pins with a plus sign indicate multiple properties matching the search criteria in that location. Clicking a pin displays information on that property. If there are multiple properties for a pin, click Next to cycle through each property summary. Tip: The map opens at a zoom level that can display the number of pins equal to the number of properties displaying on the Search Results Page. The map will display only one page‟s worth of properties at a time. See the appropriate section in the Property Matches section later in this guide for more information on changing the number of properties displayed on each Search Results Panel. On the Search Results Panel, click the View on Map link next to the Sort By box. Next Lesson: Map View Modes and Neighborhoods in Find.